I have for some time been looking at rising baskets and finally bought one recently. 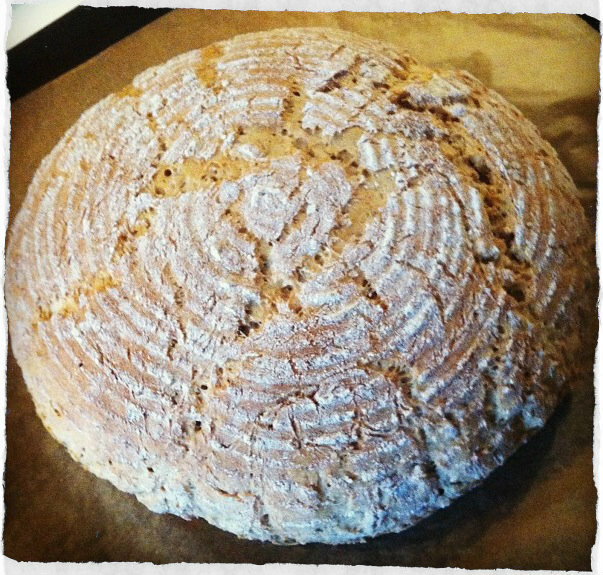 The first bread I baked using the basket was a lovely spelt bread. Mix lukewarm water and yeast with oil, salt, seeds, grains and flour in a bowl and stir well. The dough should be quite moist so be careful not to pour all the flour at once. I am using an electric whisk because I do not have a mixer. I had a bit of graham flour which I coated the rising basket with lightly, and made sure the entire basket was covered. I shaped the dough into a large ball, a bit smaller than the basket and made ​​sure that it was also well covered with flour. I but the dough in the basket and let it rise for about. 30 minutes. I put greaseproof paper on a baking tray and turned quickly turned the basket upside down onto the tray and baked the bread for approx. 20 minutes. I thought it was so beautiful, so it’s certainly not the last time I bake with a raising basket.